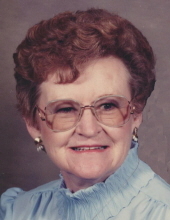 MADISON-Adeline R. "Becky" Smith, age 92, of Madison, passed away on Sunday, April 14, 2019, at Oak Park Place. She was born on March 2, 1927, in Merrimac, the daughter of August and Maude (Miller) Bechmann. Becky graduated from Portage High School. Becky worked as a secretary for Ohmeda for many years. She was a longtime member of Bethel Lutheran Church where she volunteered with many different activities and recently became a member of Messiah Lutheran Church. Becky is survived by her children, Grant (Mary) Smith and Virginia Smith; grandchildren, Kristi (Eric) Zett, Allison White, Garrett (Jenesa) Smith, Justin (Sarah) Smith, and Matthew (Alyssa) Smith; great-grandchildren, Connor, Madeline and Gavin Smith; sister-in-law, Darlene Bechmann; and many nieces and nephews. She was preceded in death by her parents; husband, Stephen Smith; daughter, Kristi Lee Smith; and brother, Harland "Bud" Bechmann. A Funeral Service will be held at GUNDERSON EAST FUNERAL AND CREMATION CARE, 5203 Monona Dr, Madison, at 12 Noon on Thursday, April 18, 2019, with the Rev. Jeff Vanden Heuvel presiding. Burial will be held at Roselawn Memorial Park. Visitation will be held at the funeral home from 10 a.m. until the time of the service on Thursday. Memorials may be gifted in Becky's name to the UW Carbone Cancer Center. Online condolences may be made at www.gundersonfh.com. "Email Address" would like to share the life celebration of Adeline R. "Becky" Smith. Click on the "link" to go to share a favorite memory or leave a condolence message for the family.